Jason Kartalian has made a glorious little confection that will make you fall in love with the movies all over again. 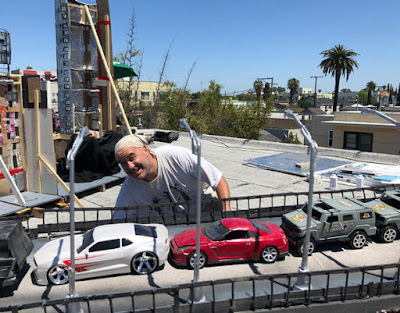 Jason's film is record of a day of shooting on a roof top in Long Beach California where Director Jeff Leroy is shooting the action and destruction scenes for his no budget scifi opus GIANTESS ATTACK. We watch the crew films the destruction of the sets by a giant female robot and two superheros in bikinis. A good time is had by all. What an absolute joy. This ten minute gem put a smile on my face from start to finish. This is a film about the joy of filmmaking. It is a film about people getting together to make a movie because they have to. Everyone involved understands the limitations of the production they are working on and everyone is okay with it because, in the best show business tradition, they are "putting on a show". What I love about the film is that Jason hasn't made a movie with any sort of attitude other than showing the joy of filmmaking. You can hear him off camera talking to the cast and crew and it's clear he is having just as much of a good time as everyone else. We see that everyone understands that they aren't making high art, but we also very clearly see that everyone is also having a good time and giving it their all, despite getting wounded. The inner kid and giant monster lover in me was absolutely delighted. This film kicked up thoughts of the days in my childhood when I made 8mm home movies about "massive" destruction. Watching the film I couldn't help but wonder what I could have done with a budget larger than 20 bucks. I also was reminded that pretending to destroy cities is really fun (which I guess explains why I still occasionally have Godzilla stamp across my desk at work). The easiest way to sum up GIANT WOMEN,MICRO-BUDGET is to simply say that this is a love letter to every filmmaker ever. This is a record of a group of people who are making movies because they have to and because they can. Watching the Jeff Leroy and his band of merry movie makers go through their paces I was reminded of the filmmakers past and present, of Georges Melies, of Dwain Esper, of Charlie Chaplin, of Spencer Williams, of DW Griffith and Spike Lee who went out and did and just created. Cinematically I was reminded of the group of filmmakers in Peter Bogdanovich's NICKELODEON who madly made silent films by the seat of their pants. Watching GIANT WOMEN, MICRO-BUDGET I fell in love with the idea of making movies once more. Of crafting things by the seat of your pants. I love the idea of knowing it isn't the best and going for it anyway. I love that it is returns our thinking of filmmaking as a business back to the notion of being something that we do because it brings us joy and allows us to laugh. To be honest I don't know if this is a great film but I know it is a joyous one. It is a film that is in love with the movies and is so big and smiley about it you can't but become infected with it- you'll want to grab a camera and go shoot something. Then again maybe that makes it a great film. Certainly it makes it one of my most favorite films of the year. HIGHLY recommended when the film starts appearing in festivals this fall.